Residential roof trusses, as shown in Figure A, are an engineered configuration of wood members placed to hold the weight of the roof's finishing materials, the internal structure's ceiling and any snow load that may occur. The information herein is written as an informative guide to residential wood roof truss construction and to provide an understanding of the basic design criteria of wood trusses. Homeowners and/or contractors must consult with the appropriate professional engineers and/or other relevant individuals, groups and bodies to ensure that the trusses are designed for the specific roof applications, geographic area where they will be located and that they will meet all pertinent building codes. General information on roof trusses. 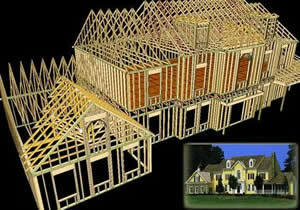 Figure A - House design using roof trusses.